Where: On any public road where there is a limit in the road width. 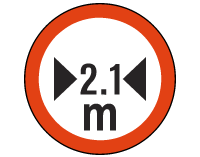 Purpose: Indicates to the driver of a vehicle that he or she shall not proceed beyond the sign unless the overall width of the vehicle, is less than the width indicated in metres, by means of a number on such sign. Action: Do not enter this area if the overall width of the vehicle you are driving exceeds the width indicated on the sign.